One || The horse jar. What a fun desk accessory. I love that it is white and if you haven't noticed horses are all the rage lately. It would make the cutest hostess gift filled with candy. And if you love it but prefer to take the DIY route check out one of my fave bloggers Nadia's post here. Two || A collection of fabulous glasses. I love all the colors and the different shapes. They would be perfect for drinking vino on a game night with friends. Have you ever played Balderdash? So fun! try it! It's one of our faves. Three || Wishbone. I love it because who doesn't love good luck? Plus it's gold and it's encased like a treasure. I always wanted something encased. I need one on my desk. Four || Famous portraits plates. How fun would it be dine with these? They also have dessert plates with another set of personalities. They are unique for sure and would make quite a statement. That wishbone jar is amazing. Perfect for a desk top! I love the wishbone and the horse jar. The wishbone would look great on a bookshelf!! Love the upright wishbone! And those classes would look lovely with a summer dinner party. That wishbone would be so cute in my office or living room. A little extra luck is always welcome! That wishbone jar is too cute! Oh fun! A new store for me to peruse. 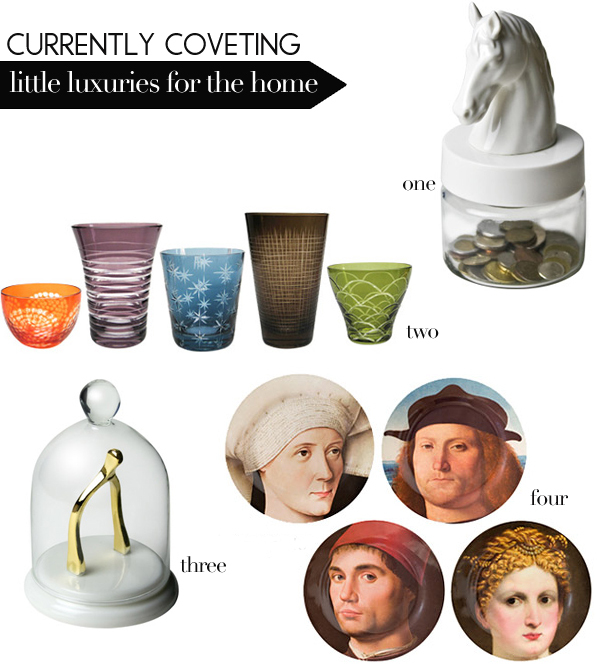 Love the horse head jar and the little treasure that is that wishbone! Thanks for the intro to this new to me website. I love that little wishbone. It's such a cute touch! oh my goodness, thanks so much for sharing these! I am moving in to a new home in August and need all the inspiration I can get - loving #3!! What great accessories! And you read my mind about the horse jar, how cute would it be to fill it with jelly beans and send it off as a gift? I love it!! love the wishbone. i really want one. Ooooh, what a darling little wishbone! It would bring you luck wherever you put it. Love the gold wishbone! It would be perfect for my dream office!!! I love the wishbone and the plates are a great conversation piece. What a great store!